The main contractor approached A J Tensile after being let down by another specialist tensile fabric sub-contractor around late August 2012. 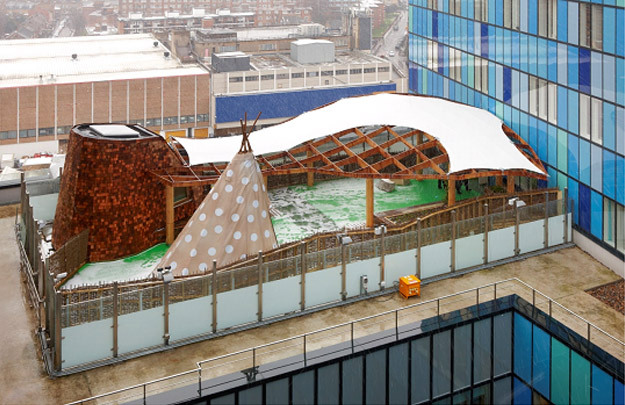 The remit was to design, manufacture and install a bespoke PVC tensile fabric roof membrane to be fixed to the glulam timber lattice support structure (designed and constructed by others). After agreeing a budget price A J Tensile were appointed to design and engineer the canopy and submit a fixed-price quotation, which came in below the maximum budget. The contract was awarded shortly afterwards and we installed the canopy in late November 2012.